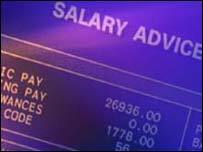 New figures show the average weekly wage in Cornwall is £100 a week less than the national average. According to the Office for National Statistics the average wage in Cornwall is £329.30 a week while the average for England is £429. People in neighbouring Devon earn about £347 a week. In Cornwall, the Caradon area has the highest average weekly wage, £375, and the lowest average wage is in North Cornwall, £307.60. Matthew Owen, head of research at the Devon and Cornwall Business Council, said: "There are an awful lot of jobs that are unskilled or semi-skilled in the hospitality trades or care that tend to get lower wages. "There are also a lot that are economically inactive such as pensioners and there are few large employers who have national wage settlements." Sarah Cemlyn from the Townsend Centre for International Poverty Research, said: "There have been a lot of traditional industries in Cornwall which have been in decline, such as mining, farming and textiles. "It can mean people having to take what they can get and so they have to work long hours for low wages." Julie Innes, a receptionist from Camborne, said although wages were low, other costs such as council tax, petrol and food were the same. "Childcare is a huge issue," she said. "I don't know how people cope with finding reliable and affordable care. "Childcare is out of many people's reach. A lot rely on friends and family rather than qualified care."